We are incredibly blessed here in Santa Monica, CA. While most of the United States is donning snow boots and parkas, we are wearing flip-flops and jean shorts. Whereas most people have to take an entire day or even weekend out of going to the beach, it is outside our doorsteps. Yet what is truly unique in its abundance in Santa Monica is Yoga. With the frequent opening of new and innovative yoga studios, Santa Monica has quickly become the yoga capital of the United States, and perhaps even the world. What we don’t realize is that even a half an hour out of Los Angeles, good yoga is hard to find, particularly in the more rural areas. Further to that, what seems like an every day part of our California culture – I mean, you literally can’t go more than a mile without seeing someone with their mat – is still pretty foreign and inaccessible outside of our great city. I know Yoga is fantastic, you know Yoga is fantastic (you wouldn’t be reading this blog otherwise! ), but most people are unfamiliar with the practice and have either all the wrong ideas about it or none at all. And frankly, this is a time in our culture when we need it the most. Americans as a culture are over-stressed, over-worked, and overweight. Yoga is an incredible antidote to all of those issues and could quite literally make this world a better place if more people practiced. But in order to practice, many people need time and unfortunately, money. The people of Santa Monica are also lucky in that most don’t seem to have regular 9-5 jobs (or any at all if you go to Peet’s midday on a Wednesday), yet they still manage to make it to their Yoga classes a few times a week. Again though, we are uniquely blessed here in Santa Monica with not just Yoga studios, but donation studios where one can pay what they can afford. This discrepancy coupled by a yearning to give back spawned the idea to start the National Yoga Project (NYP). I want to bring Yoga to all the places that do not have the resources for it. I realize that it sounds like a tall order, but it should be! I want to bring yoga into schools, so children can learn how to better self-regulate, all the while staying active. I want to bring it into hospitals for both doctors and patients to help them each deal with the stresses they face and perhaps even find some peace amidst the chaos. I want to bring it into other non-profits so that the workers can have an outlet. I want to help develop studios or programs in more rural areas that would not necessarily have the teachers or resources to start their own. Where else do you see a lack that NYP can help begin to fill? Some pix from NYP's first event "5+5"
The National Yoga Project’s first big event was called the “5+5= Fit Challenge” and took place on December 9th, 2010. Five Los Angeles schools participated, each school holding their own class and by the end of the day, thanks to the aid of 7 incredible teachers and 11 equally fantastic assistants, we had over 250 kids practicing!!! It was an incredible success and the beginning of much to come. We are now hoping to do smaller scale classes at each school specifically. Overall I want to create a nation of yogi/nis and YOU can help me do this. I need teachers, schools, ideas, and manpower. If you are interested in becoming a part of the movement, please email me at: Sarah@Sarahezrinyoga.com. Signal when driving- even you Mister Postman, being a federal officer does not dismiss you from this duty! "Some pix from NYP's first event "5+5"
Together we can make this world better and we are going to do it through Yoga. 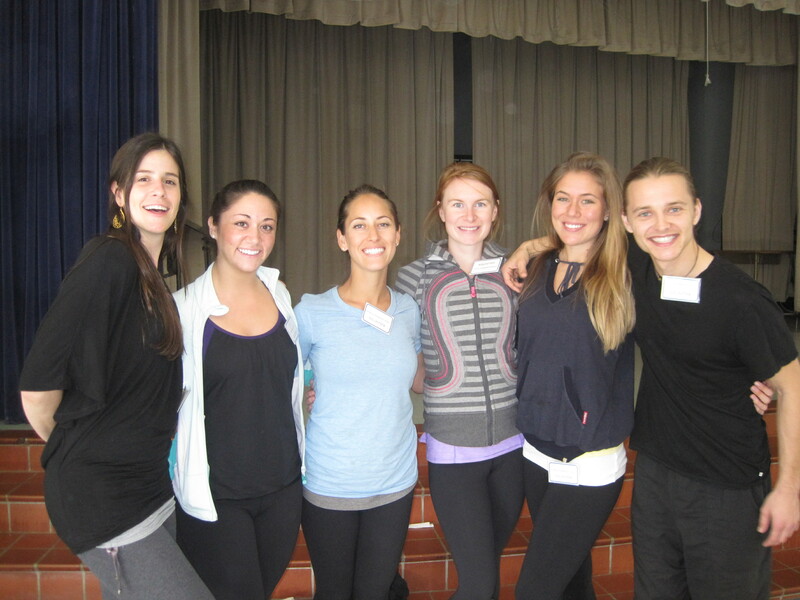 Sarah Ezrin, founder of National Yoga Project, is a Los Angeles-based yoga instructor who has been influenced and mentored by many gifted teachers over the years, including Bryan Kest, Lisa Walford, Sonya Cottle, and Rudy Mettia. Sarah is 500-hour teacher trained through YogaWorks, where Sarah is an instructor. Sarah also teaches at Bryan Kest’s Power Yoga and Equinox Fitness. She is an ambassador for both Lululemon Athletica and Manduka. Through the National Yoga Project, Sarah hopes to make yoga universally accessible, especially for those who do not have the resources. Sarah’s fun but challenging flow classes explore breath-linked movement within intelligent sequencing and a lot of laughter. For more information on Sarah and the National Yoga Project, please visit: www.sarahezrinyoga.com.